Have your bonus Hilton points from the AMEX Membership Rewards transfer promo posted yet? 10 Comments on Have your bonus Hilton points from the AMEX Membership Rewards transfer promo posted yet? 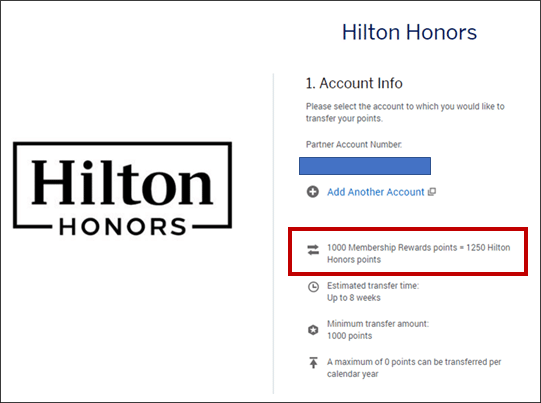 Some AMEX cardholders who transferred Membership Rewards points to Hilton last year are still waiting for their bonus points to credit. My case got resolved...in a very strange manner. Back in October last year, AMEX sent out an eDM about a points transfer promotion I thought was too good to be true. From 30 Oct to 20 Dec, AMEX cardholders could get 3 Hilton points for every Membership Rewards (MR) point they transferred, with no cap. There was some confusion because the eDM mentioned a “50% higher than usual rate”, which given the base rate of 1 MR: 1.25 Hilton points would work out to 1 MR: 1.875 Hilton points. 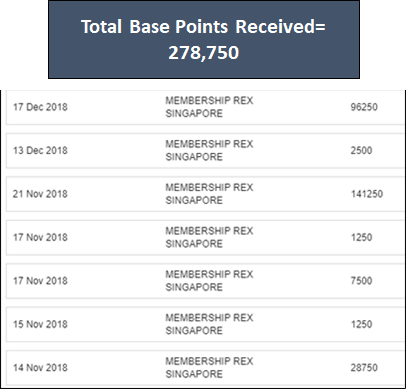 However, AMEX confirmed that the 1:3 ratio was legit, and for a few months, we had an amazing way to earn hotel points in Singapore on our hands. The timing of the promotion worked out great for me, because I was flush with MR points after using my wedding to hit the $20K sign up bonus on the AMEX Platinum Charge (even after hitting the sign up bonus I still made the AMEX Platinum Charge my default card for everything, because I really wanted to earn hotel points. Put it another way- you can earn KrisFlyer miles almost everywhere. 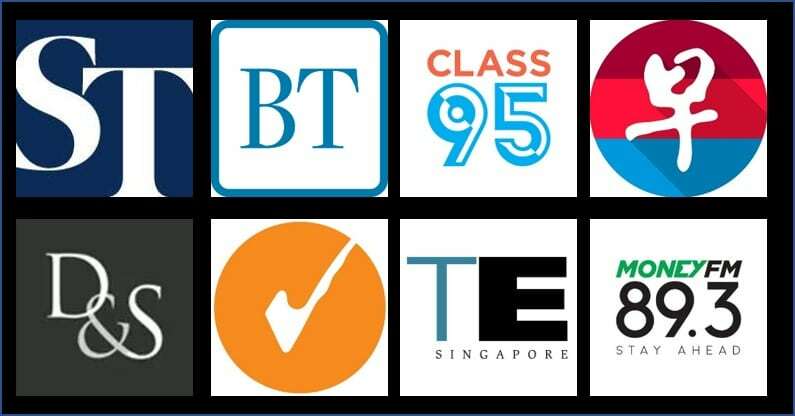 How often can you earn hotel points at a decent rate in Singapore?). I was so paranoid about the promotion being pulled early that I was transferring my MR points as soon as I had enough for one batch, taking advantage of the fact that there’s no conversion fee. All in all I transferred 222,000 MR points, which should have yielded me 666,000 Hilton points. Initially, I just saw the base points posting. That’s fine, I thought. The T&Cs say that the points can take up to 8 weeks to be credited anyway. But then in December something strange started happening. Bonus points were posting to my Hilton account, but it wasn’t at the 1:3 ratio. In fact, the math simply didn’t make any sense at all- I’d transferred the equivalent of 278,750 base Hilton points. 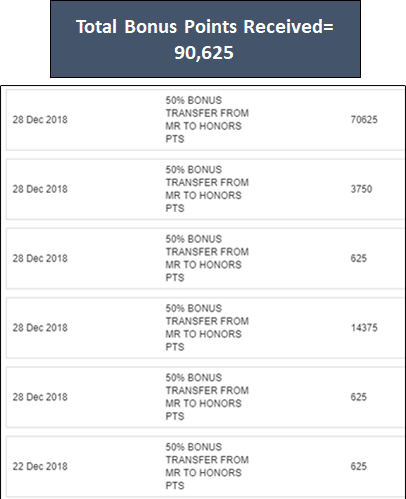 Even if the bonus were only 50%, I should have received 139,375 bonus points in total, not 90,625. After a few back and forth calls with AMEX customer service, I was told that I’d need to wait the full 8 weeks for the rest of the bonus to be reflected. That meant waiting till 14 January, based on my first transfer on 14 November. Well 14 January came and went, and nothing appeared in my account. AMEX customer service, which is normally excellent, appeared to be confused about what was going on. A couple of CSOs suggested that the remaining points were supposed to be credited by Hilton, and I had to get in touch with Hilton customer service to sort it out. Fortunately, a few others doggedly followed up on this case from the AMEX side, and at long last during the CNY break I was given the solution: AMEX would make up the difference by crediting the equivalent number of MR points into my account, then immediately transferring them over to Hilton. It’s a very strange way to resolve the matter, to say the least, and the manual nature of the crediting makes me feel that maybe they’re honoring this more on a goodwill basis than an intentional campaign. The funny thing is: even after this adjustment, I still don’t have the right number of points. I should have received 666,000 Hilton points, but to date I’ve received a total of 640,625-still shy of 25,375. I got on the phone once more with customer service, and was told they’d once again credit the equivalent MR points to my account before doing the Hilton transfer again. And that, I hope, will be the end of that. This whole process has been long drawn out and arduous, but I’ve eventually been made whole. I understand from the Telegram group that there are quite a few still cardholders waiting for their points to reflect correctly. Some of you may have already raised this with AMEX customer service, and hopefully my experience provides you with a proposed solution when talking to them. I do believe some AMEX cardholders also received unexplained MR points transfers to their accounts in early January, so those may be in relation to this Hilton transfer bonus too. 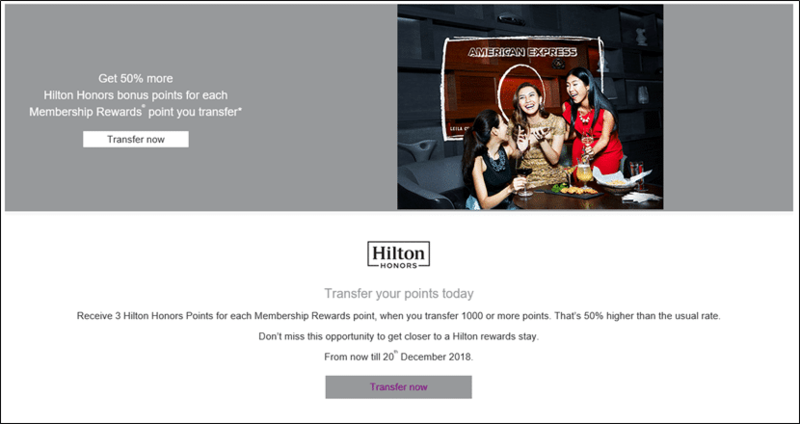 If you transferred MR points to Hilton under the promotion, be sure to reconcile your points transferred with the points received! If there’s any discrepancy, get on the phone with AMEX customer service and request that they sort it out. Thanks for this (amongst all the other thanks), Aaron! Thanks to you, I did a re-look at my two transfers… and if Rewards Statement is what it is, then I was ‘underpaid’ about 200,000 HH pts!! Sad to say Amex customer service has become very unreliable as of late. Not sure if it is due to a change in management team. I had several cases of missing points and missing credits which took a few months to resolve. It is on the onus of the cardholder to monitor and calculate everything otherwise American express will just benefit at the expense of the cardholder. Only received half the Hilton points, but earlier this year there was a deposit of MR points from AMEX for no reason (no forced conversion into Hilton) so I’m a happy camper! Omg…. did not realised that so many also having bad experiences…. I thought i was the only one…. I have spoken with amex’s managers who promised to get back on points but never did…. have to chase and chase for weeks still no news…. even their so called head, alfred, is curt and rude, shirking responsibilities away from himself…. very disappointing…. silly me wanted to apply for a reserve card…. forget it better put my money elsewhere…. I’ve also received a bunch of MR points credited to my account which I suspect was arising from this exercise. Although I’m only getting the 50% bonus HH points from the transfer, I can’t complain at all. Through this exercise, I’ve gain HH points and ended up with more MR points than what I have started with. I’ll be keeping these MR points for future miles conversion instead. Kudos to Amex for doing what they could to honor this promotion.